Winger Derk Boerrigter believes Celtic can overcome AC Milan on Tuesday night to boost their chances of progressing to the last 16 of the Champions League. The Dutchman scored his first goal for Celtic in the 3-1 victory against Aberdeen on Saturday and said the win should boost the squad's confidence. "We have to win," said Boerrigter. "It's the only thing I can say. "We have to be sharp. It's an important game if we want to pass Ajax, we definitely have to win this game." Neil Lennon's side head in to Tuesday's encounter in Glasgow at the bottom of Group H with just three points, one behind Boeriggter's former side Ajax, knowing a win against Milan would give them a one point advantage over the Italian giants. After that, Celtic face Barcelona in their final group game in the Nou Camp in two weeks' time. The opening group match at the San Siro saw Celtic succumb to a 2-0 defeat, but Milan's recent run of form has produced only three wins from their opening 12 Serie A matches, including a 1-1 draw with Genoa at the weekend. 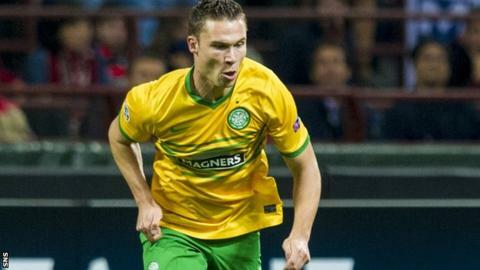 "We can see if we can get a good result in Barcelona, but that'll be a little bit harder than Tuesday," said Boerrigter. "I have confidence and faith that we can get a good result and win the game." Following a 2-1 home win against Boerrigter's former side Ajax, Lennon's men put on one of their worst European performances in recent years in the return leg in Amsterdam, losing 1-0 when Lasse Schone scored the only goal of the game. Boerrigter insisted Celtic can play much better than their Amsterdam performance indicated, and would be focused on victory against Milan to revive their qualification hopes. "It was not a good result, it was not our play, but we can straighten things and play our game and beat Milan here."